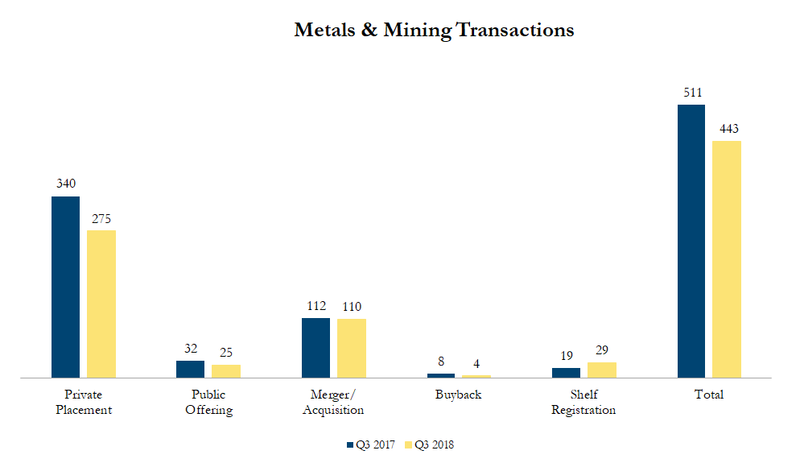 Q3 2018 Metals & Mining Transactions – Sinclair Range Inc.
On July 16, 2018, Lundin Mining announced a C$1.4 billion cash offer for Nevsun Resources, at $4.75 per share. The offer represents an 82% premium to Nevsun’s closing price on February 6 when Lundin first indicated interest in acquiring Nevsun’s Serbian copper and gold project, Timok. This is Lundin’s 5th offer and follows it’s latest attempt, in May 2018 to take over Nevsun for $1.5 billion in cash and shares of Lundin and its partner in the deal, Euro Sun Mining. The transaction carries an implied Price / NAV (Net Asset Value) of 0.70x based on analyst estimates, slightly higher than precedent base metal developer transactions that average of 0.66x P/NAV since 2010. On July 26, 2018, Newmont acquired a 50% stake in the Galore Creek Project in British Columbia from NOVAGOLD Resources and to form a partnership with Teck Resources Ltd who owns the remaining 50%. Galore Creek one of the largest undeveloped copper-gold projects with 8 million ounces of gold and 9 billion pounds of copper. The transaction carries a total consideration of $275 million, with $100 million upon closing, $75 million at the earliest of prefeasibility study or three years from closing, $25 million at the earliest synchronicity of feasibility study or five years from closing and a final $75 million payment contingent on final decision to develop the project.